WOOD/LEATHER STEERING WHEEL, WHEELS: 19 AMG® MULTI-SPOKE ALLOY, WHEEL LOCKING BOLTS, PREMIUM PACKAGE -inc: Active Multicontour Seats w/Massage, KEYLESS GO, Heated & Active Ventilated Front Seats, Grey-Painted Brake Calipers w/Perforated Discs, AIRSCARF® Neck-Level Heating System, HANDS-FREE ACCESS, Active Parking Assist, Electronic Trunk Closer, PORCELAIN/BLACK, NAPPA LEATHER UPHOLSTERY, PANORAMA ROOF, ILLUMINATED DOOR SILLS, HIGH-GLOSS BLACK ASH WOOD TRIM, GRAPHITE GREY METALLIC, FLOORMATS. This Mercedes-Benz SL has a powerful Twin Turbo Premium Unleaded V-6 3.0 L/183 engine powering this Automatic transmission. *These Packages Will Make Your Mercedes-Benz SL SL 450 The Envy of Your Friends *DRIVER ASSISTANCE PACKAGE -inc: Speed Limit Assist, PRESAFE Brake w/Collision Mitigation, Active Brake Assist w/Cross-Traffic Function, Active Distance Assist DISTRONIC, Active Steering Assist, BAS® PLUS, PRESAFE PLUS, DISTRONIC PLUS® w/Steering Assist, PRESAFE PLUS, Active Lane Keeping Assist, Blind Spot Assist , Window Grid Diversity Antenna, Wheels: 19 5-Spoke Light Alloy w/Black Accents, Valet Function, Trunk Rear Cargo Access, Trip Computer, Transmission: 9G-TRONIC Automatic, Tracker System, Tires: 255/35R19 Front & 285/30R19 Rear, Tire Specific Low Tire Pressure Warning, Tailgate/Rear Door Lock Included w/Power Door Locks, Systems Monitor, Streaming Audio, Sport Leather/Metal-Look Steering Wheel w/Auto Tilt-Away, Smart Device Integration, Siriusxm Traffic Real-Time Traffic Display, SIRIUS XM Satellite Radio, Side Impact Beams, Run-Flat Tires, Remote Releases -Inc: Power Cargo Access. 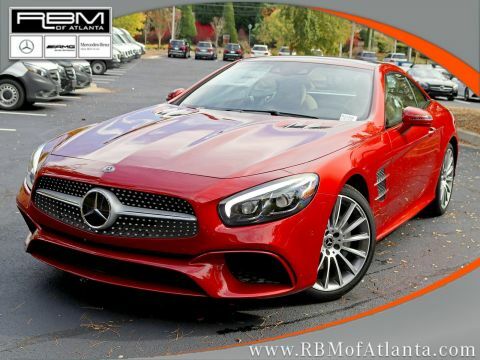 * Stop By Today *Treat yourself- stop by RBM of Atlanta located at 7640 Roswell Road, Atlanta, GA 30350 to make this car yours today!WOOD/LEATHER STEERING WHEEL, WHEELS: 19 AMG® MULTI-SPOKE ALLOY, WHEEL LOCKING BOLTS, PREMIUM PACKAGE -inc: Active Multicontour Seats w/Massage, KEYLESS GO, Heated & Active Ventilated Front Seats, Grey-Painted Brake Calipers w/Perforated Discs, AIRSCARF® Neck-Level Heating System, HANDS-FREE ACCESS, Active Parking Assist, Electronic Trunk Closer, PORCELAIN/BLACK, NAPPA LEATHER UPHOLSTERY, PANORAMA ROOF, ILLUMINATED DOOR SILLS, HIGH-GLOSS BLACK ASH WOOD TRIM, GRAPHITE GREY METALLIC, FLOORMATS. This Mercedes-Benz SL has a powerful Twin Turbo Premium Unleaded V-6 3.0 L/183 engine powering this Automatic transmission. *These Packages Will Make Your Mercedes-Benz SL SL 450 The Envy of Your Friends *DRIVER ASSISTANCE PACKAGE -inc: Speed Limit Assist, PRESAFE Brake w/Collision Mitigation, Active Brake Assist w/Cross-Traffic Function, Active Distance Assist DISTRONIC, Active Steering Assist, BAS® PLUS, PRESAFE PLUS, DISTRONIC PLUS® w/Steering Assist, PRESAFE PLUS, Active Lane Keeping Assist, Blind Spot Assist , Window Grid Diversity Antenna, Wheels: 19 5-Spoke Light Alloy w/Black Accents, Valet Function, Trunk Rear Cargo Access, Trip Computer, Transmission: 9G-TRONIC Automatic, Tracker System, Tires: 255/35R19 Front & 285/30R19 Rear, Tire Specific Low Tire Pressure Warning, Tailgate/Rear Door Lock Included w/Power Door Locks, Systems Monitor, Streaming Audio, Sport Leather/Metal-Look Steering Wheel w/Auto Tilt-Away, Smart Device Integration, Siriusxm Traffic Real-Time Traffic Display, SIRIUS XM Satellite Radio, Side Impact Beams, Run-Flat Tires, Remote Releases -Inc: Power Cargo Access. * Stop By Today *Treat yourself- stop by RBM of Atlanta located at 7640 Roswell Road, Atlanta, GA 30350 to make this car yours today! WOOD/LEATHER STEERING WHEEL, WHEELS: 19 AMG® MULTI-SPOKE ALLOY, WHEEL LOCKING BOLTS, SADDLE BROWN/BLACK, NAPPA LEATHER UPHOLSTERY, PREMIUM PACKAGE -inc: Active Multicontour Seats w/Massage, KEYLESS GO, Heated & Active Ventilated Front Seats, Grey-Painted Brake Calipers w/Perforated Discs, AIRSCARF® Neck-Level Heating System, HANDS-FREE ACCESS, Active Parking Assist, Electronic Trunk Closer, PANORAMA ROOF, ILLUMINATED DOOR SILLS, HIGH-GLOSS BLACK ASH WOOD TRIM, GRAPHITE GREY METALLIC, FLOORMATS. This Mercedes-Benz SL has a powerful Twin Turbo Premium Unleaded V-6 3.0 L/183 engine powering this Automatic transmission. *This Mercedes-Benz SL SL 450 Has Everything You Want *DRIVER ASSISTANCE PACKAGE -inc: Speed Limit Assist, PRESAFE Brake w/Collision Mitigation, Active Brake Assist w/Cross-Traffic Function, Active Distance Assist DISTRONIC, Active Steering Assist, BAS® PLUS, PRESAFE PLUS, DISTRONIC PLUS® w/Steering Assist, PRESAFE PLUS, Active Lane Keeping Assist, Blind Spot Assist , Window Grid Diversity Antenna, Wheels: 19 5-Spoke Light Alloy w/Black Accents, Valet Function, Trunk Rear Cargo Access, Trip Computer, Transmission: 9G-TRONIC Automatic, Tracker System, Tires: 255/35R19 Front & 285/30R19 Rear, Tire Specific Low Tire Pressure Warning, Tailgate/Rear Door Lock Included w/Power Door Locks, Systems Monitor, Streaming Audio, Sport Leather/Metal-Look Steering Wheel w/Auto Tilt-Away, Smart Device Integration, Siriusxm Traffic Real-Time Traffic Display, SIRIUS XM Satellite Radio, Side Impact Beams, Run-Flat Tires, Remote Releases -Inc: Power Cargo Access. 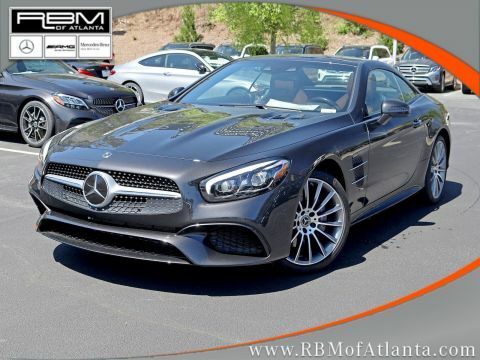 * Stop By Today *A short visit to RBM of Atlanta located at 7640 Roswell Road, Atlanta, GA 30350 can get you a dependable SL today!WOOD/LEATHER STEERING WHEEL, WHEELS: 19 AMG® MULTI-SPOKE ALLOY, WHEEL LOCKING BOLTS, SADDLE BROWN/BLACK, NAPPA LEATHER UPHOLSTERY, PREMIUM PACKAGE -inc: Active Multicontour Seats w/Massage, KEYLESS GO, Heated & Active Ventilated Front Seats, Grey-Painted Brake Calipers w/Perforated Discs, AIRSCARF® Neck-Level Heating System, HANDS-FREE ACCESS, Active Parking Assist, Electronic Trunk Closer, PANORAMA ROOF, ILLUMINATED DOOR SILLS, HIGH-GLOSS BLACK ASH WOOD TRIM, GRAPHITE GREY METALLIC, FLOORMATS. This Mercedes-Benz SL has a powerful Twin Turbo Premium Unleaded V-6 3.0 L/183 engine powering this Automatic transmission. *This Mercedes-Benz SL SL 450 Has Everything You Want *DRIVER ASSISTANCE PACKAGE -inc: Speed Limit Assist, PRESAFE Brake w/Collision Mitigation, Active Brake Assist w/Cross-Traffic Function, Active Distance Assist DISTRONIC, Active Steering Assist, BAS® PLUS, PRESAFE PLUS, DISTRONIC PLUS® w/Steering Assist, PRESAFE PLUS, Active Lane Keeping Assist, Blind Spot Assist , Window Grid Diversity Antenna, Wheels: 19 5-Spoke Light Alloy w/Black Accents, Valet Function, Trunk Rear Cargo Access, Trip Computer, Transmission: 9G-TRONIC Automatic, Tracker System, Tires: 255/35R19 Front & 285/30R19 Rear, Tire Specific Low Tire Pressure Warning, Tailgate/Rear Door Lock Included w/Power Door Locks, Systems Monitor, Streaming Audio, Sport Leather/Metal-Look Steering Wheel w/Auto Tilt-Away, Smart Device Integration, Siriusxm Traffic Real-Time Traffic Display, SIRIUS XM Satellite Radio, Side Impact Beams, Run-Flat Tires, Remote Releases -Inc: Power Cargo Access. * Stop By Today *A short visit to RBM of Atlanta located at 7640 Roswell Road, Atlanta, GA 30350 can get you a dependable SL today! WHEELS: 19 AMG® MULTI-SPOKE, WHEEL LOCKING BOLTS, SOFT CLOSE DOORS, PANORAMA ROOF, ILLUMINATED DOOR SILLS, GINGER BEIGE/ESP®RESSO, LEATHER UPHOLSTERY, FLOORMATS, DRIVER ASSISTANCE PACKAGE -inc: Speed Limit Assist, PRESAFE Brake w/Collision Mitigation, Active Brake Assist w/Cross-Traffic Function, Active Distance Assist DISTRONIC, BAS® PLUS, PRESAFE PLUS, DISTRONIC PLUS® w/Steering Assist, PRESAFE PLUS, Active Lane Keeping Assist, Blind Spot Assist, DESIGNO DIAMOND WHITE METALLIC, BURL WALNUT WOOD TRIM. This Mercedes-Benz SL has a dependable Twin Turbo Premium Unleaded V-8 4.7 L/285 engine powering this Automatic transmission. *This Mercedes-Benz SL SL 550 Has Everything You Want *Window Grid Diversity Antenna, Wheels: 19 AMG® 5-Spoke, Wheels w/Silver Accents, Valet Function, Trunk/Hatch Auto-Latch, Trip Computer, Transmission: 9G-TRONIC Automatic, Tracker System, Tires: 255/35R19 Front & 285/30R19 Rear, Tire Specific Low Tire Pressure Warning, Tailgate/Rear Door Lock Included w/Power Door Locks, Systems Monitor, Streaming Audio, Sport Leather/Metal-Look Steering Wheel w/Auto Tilt-Away, Smartphone Integration, Siriusxm Traffic Real-Time Traffic Display, SIRIUS XM Satellite Radio, Side Impact Beams, Seats w/Leather Back Material, Run-Flat Tires. 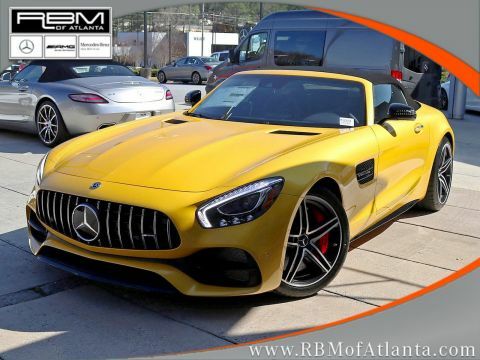 * Stop By Today *Treat yourself- stop by RBM of Atlanta located at 7640 Roswell Road, Atlanta, GA 30350 to make this car yours today!WHEELS: 19 AMG® MULTI-SPOKE, WHEEL LOCKING BOLTS, SOFT CLOSE DOORS, PANORAMA ROOF, ILLUMINATED DOOR SILLS, GINGER BEIGE/ESP®RESSO, LEATHER UPHOLSTERY, FLOORMATS, DRIVER ASSISTANCE PACKAGE -inc: Speed Limit Assist, PRESAFE Brake w/Collision Mitigation, Active Brake Assist w/Cross-Traffic Function, Active Distance Assist DISTRONIC, BAS® PLUS, PRESAFE PLUS, DISTRONIC PLUS® w/Steering Assist, PRESAFE PLUS, Active Lane Keeping Assist, Blind Spot Assist, DESIGNO DIAMOND WHITE METALLIC, BURL WALNUT WOOD TRIM. This Mercedes-Benz SL has a dependable Twin Turbo Premium Unleaded V-8 4.7 L/285 engine powering this Automatic transmission. *This Mercedes-Benz SL SL 550 Has Everything You Want *Window Grid Diversity Antenna, Wheels: 19 AMG® 5-Spoke, Wheels w/Silver Accents, Valet Function, Trunk/Hatch Auto-Latch, Trip Computer, Transmission: 9G-TRONIC Automatic, Tracker System, Tires: 255/35R19 Front & 285/30R19 Rear, Tire Specific Low Tire Pressure Warning, Tailgate/Rear Door Lock Included w/Power Door Locks, Systems Monitor, Streaming Audio, Sport Leather/Metal-Look Steering Wheel w/Auto Tilt-Away, Smartphone Integration, Siriusxm Traffic Real-Time Traffic Display, SIRIUS XM Satellite Radio, Side Impact Beams, Seats w/Leather Back Material, Run-Flat Tires. * Stop By Today *Treat yourself- stop by RBM of Atlanta located at 7640 Roswell Road, Atlanta, GA 30350 to make this car yours today! WOOD/LEATHER STEERING WHEEL, WHEELS: 19 AMG® MULTI-SPOKE, WHEEL LOCKING BOLTS, SOFT CLOSE DOORS, PANORAMA ROOF, ILLUMINATED DOOR SILLS, GINGER BEIGE/ESP®RESSO, NAPPA LEATHER UPHOLSTERY, FLOORMATS, DRIVER ASSISTANCE PACKAGE -inc: Speed Limit Assist, PRESAFE Brake w/Collision Mitigation, Active Brake Assist w/Cross-Traffic Function, Active Distance Assist DISTRONIC, BAS® PLUS, PRESAFE PLUS, DISTRONIC PLUS® w/Steering Assist, PRESAFE PLUS, Active Lane Keeping Assist, Blind Spot Assist, BURL WALNUT WOOD TRIM. This Mercedes-Benz SL has a powerful Twin Turbo Premium Unleaded V-8 4.7 L/285 engine powering this Automatic transmission. *This Mercedes-Benz SL SL 550 Roadster Has Everything You Want *Window Grid Diversity Antenna, Wheels: 19 AMG® 5-Spoke, Wheels w/Silver Accents, Valet Function, Trunk/Hatch Auto-Latch, Trip Computer, Transmission: 9G-TRONIC Automatic, Tracker System, Tires: 255/35R19 Front & 285/30R19 Rear, Tire Specific Low Tire Pressure Warning, Tailgate/Rear Door Lock Included w/Power Door Locks, Systems Monitor, Streaming Audio, Sport Leather/Metal-Look Steering Wheel w/Auto Tilt-Away, Smartphone Integration, Siriusxm Traffic Real-Time Traffic Display, SIRIUS XM Satellite Radio, Side Impact Beams, Seats w/Leather Back Material, Run-Flat Tires. 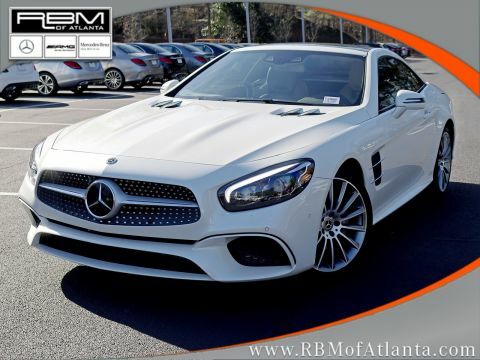 * Visit Us Today *A short visit to RBM of Atlanta located at 7640 Roswell Road, Atlanta, GA 30350 can get you a dependable SL today!WOOD/LEATHER STEERING WHEEL, WHEELS: 19 AMG® MULTI-SPOKE, WHEEL LOCKING BOLTS, SOFT CLOSE DOORS, PANORAMA ROOF, ILLUMINATED DOOR SILLS, GINGER BEIGE/ESP®RESSO, NAPPA LEATHER UPHOLSTERY, FLOORMATS, DRIVER ASSISTANCE PACKAGE -inc: Speed Limit Assist, PRESAFE Brake w/Collision Mitigation, Active Brake Assist w/Cross-Traffic Function, Active Distance Assist DISTRONIC, BAS® PLUS, PRESAFE PLUS, DISTRONIC PLUS® w/Steering Assist, PRESAFE PLUS, Active Lane Keeping Assist, Blind Spot Assist, BURL WALNUT WOOD TRIM. This Mercedes-Benz SL has a powerful Twin Turbo Premium Unleaded V-8 4.7 L/285 engine powering this Automatic transmission. *This Mercedes-Benz SL SL 550 Roadster Has Everything You Want *Window Grid Diversity Antenna, Wheels: 19 AMG® 5-Spoke, Wheels w/Silver Accents, Valet Function, Trunk/Hatch Auto-Latch, Trip Computer, Transmission: 9G-TRONIC Automatic, Tracker System, Tires: 255/35R19 Front & 285/30R19 Rear, Tire Specific Low Tire Pressure Warning, Tailgate/Rear Door Lock Included w/Power Door Locks, Systems Monitor, Streaming Audio, Sport Leather/Metal-Look Steering Wheel w/Auto Tilt-Away, Smartphone Integration, Siriusxm Traffic Real-Time Traffic Display, SIRIUS XM Satellite Radio, Side Impact Beams, Seats w/Leather Back Material, Run-Flat Tires. * Visit Us Today *A short visit to RBM of Atlanta located at 7640 Roswell Road, Atlanta, GA 30350 can get you a dependable SL today! WHEELS: 19 FR/20 RR AMG® SPLIT 5-SPOKE BLACK -inc: Tires: 265/35R19 Fr 295/30R20 Rr, LANE TRACKING PACKAGE -inc: Blind Spot Assist, Lane Keeping Assist, KEYLESS GO -inc: Power Trunk Release, HEATED & VENTILATED FRONT SEATS, FIXED PANORAMA ROOF -inc: roller shade, BURMESTER SURROUND SOUND SYSTEM -inc: 10 high-performance speakers including subwoofer in rear, 10-channel DSP amplifier w/a total system output of 640 watts, BLACK, NAPPA LEATHER UPHOLSTERY, BLACK, AMG® SILVER CHROME TRIM, AMG® PERFORMANCE EXHAUST SYSTEM. This Mercedes-Benz AMG® GT has a powerful Twin Turbo Premium Unleaded V-8 4.0 L/243 engine powering this Automatic transmission. *This Mercedes-Benz AMG® GT AMG® GT Has Everything You Want *AMG® EXTERIOR NIGHT PACKAGE -inc: enhanced matte black finish for front splitter, air intake flics, front wheel arch flics, side sill extensions and high-gloss black fixed rear spoiler , Voice Activated Dual Zone Front Automatic Air Conditioning, Valet Function, Turn-By-Turn Navigation Directions, Trunk/Hatch Auto-Latch, Trip Computer, Transmission: 7-Speed AMG® SPEEDSHIFT® DCT Automatic, Transmission w/Driver Selectable Mode, Tracker System, Tires: 255/35R19 Fr 295/30R19 Rr, Tire Specific Low Tire Pressure Warning, Tailgate/Rear Door Lock Included w/Power Door Locks, Systems Monitor, Streaming Audio, Sport Tuned Suspension, Spare Tire Mobility Kit, Smart Device Integration, SiriusXM Radio with Free Trial Period, Single DVD Drive, Side Impact Beams. 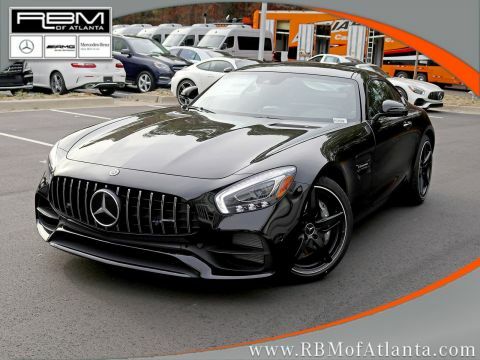 * Stop By Today *For a must-own Mercedes-Benz AMG® GT come see us at RBM of Atlanta, 7640 Roswell Road, Atlanta, GA 30350. Just minutes away!WHEELS: 19 FR/20 RR AMG® SPLIT 5-SPOKE BLACK -inc: Tires: 265/35R19 Fr 295/30R20 Rr, LANE TRACKING PACKAGE -inc: Blind Spot Assist, Lane Keeping Assist, KEYLESS GO -inc: Power Trunk Release, HEATED & VENTILATED FRONT SEATS, FIXED PANORAMA ROOF -inc: roller shade, BURMESTER SURROUND SOUND SYSTEM -inc: 10 high-performance speakers including subwoofer in rear, 10-channel DSP amplifier w/a total system output of 640 watts, BLACK, NAPPA LEATHER UPHOLSTERY, BLACK, AMG® SILVER CHROME TRIM, AMG® PERFORMANCE EXHAUST SYSTEM. This Mercedes-Benz AMG® GT has a powerful Twin Turbo Premium Unleaded V-8 4.0 L/243 engine powering this Automatic transmission. *This Mercedes-Benz AMG® GT AMG® GT Has Everything You Want *AMG® EXTERIOR NIGHT PACKAGE -inc: enhanced matte black finish for front splitter, air intake flics, front wheel arch flics, side sill extensions and high-gloss black fixed rear spoiler , Voice Activated Dual Zone Front Automatic Air Conditioning, Valet Function, Turn-By-Turn Navigation Directions, Trunk/Hatch Auto-Latch, Trip Computer, Transmission: 7-Speed AMG® SPEEDSHIFT® DCT Automatic, Transmission w/Driver Selectable Mode, Tracker System, Tires: 255/35R19 Fr 295/30R19 Rr, Tire Specific Low Tire Pressure Warning, Tailgate/Rear Door Lock Included w/Power Door Locks, Systems Monitor, Streaming Audio, Sport Tuned Suspension, Spare Tire Mobility Kit, Smart Device Integration, SiriusXM Radio with Free Trial Period, Single DVD Drive, Side Impact Beams. 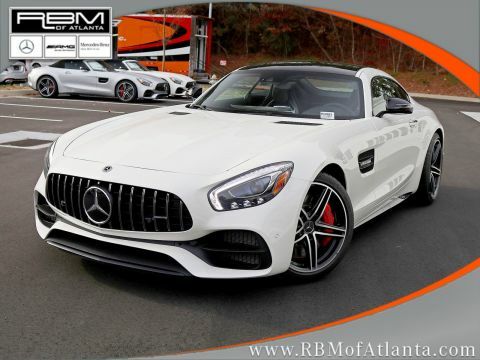 * Stop By Today *For a must-own Mercedes-Benz AMG® GT come see us at RBM of Atlanta, 7640 Roswell Road, Atlanta, GA 30350. Just minutes away! WHEELS: 19 AMG® MULTI-SPOKE, WHEEL LOCKING BOLTS, SOFT CLOSE DOORS, PANORAMA ROOF, ILLUMINATED DOOR SILLS, GRAPHITE GREY METALLIC, DRIVER ASSISTANCE PACKAGE -inc: Speed Limit Assist, PRESAFE Brake w/Collision Mitigation, Active Brake Assist w/Cross-Traffic Function, Active Distance Assist DISTRONIC, BAS® PLUS, PRESAFE PLUS, DISTRONIC PLUS® w/Steering Assist, PRESAFE PLUS, Active Lane Keeping Assist, Blind Spot Assist, DINAMICA HEADLINER BLACK, BLACK, EXCLUSIVE NAPPA LEATHER UPHOLSTERY, AMG® CARBON FIBER TRIM. This Mercedes-Benz SL has a powerful Twin Turbo Premium Unleaded V-8 4.7 L/285 engine powering this Automatic transmission. *These Packages Will Make Your Mercedes-Benz SL SL 550 The Envy of Your Friends *Wheels: 19 AMG® 5-Spoke, Wheels w/Silver Accents, Valet Function, Trunk/Hatch Auto-Latch, Trip Computer, Transmission: 9G-TRONIC Automatic, Tracker System, Tires: 255/35R19 Front & 285/30R19 Rear, Tire Specific Low Tire Pressure Warning, Tailgate/Rear Door Lock Included w/Power Door Locks, Systems Monitor, Streaming Audio, Sport Leather/Metal-Look Steering Wheel w/Auto Tilt-Away, Smartphone Integration, Siriusxm Traffic Real-Time Traffic Display, SIRIUS XM Satellite Radio, Side Impact Beams, Seats w/Leather Back Material, Run-Flat Tires, Remote Releases -Inc: Proximity Cargo Access. * Stop By Today *For a must-own Mercedes-Benz SL come see us at RBM of Atlanta, 7640 Roswell Road, Atlanta, GA 30350. Just minutes away!WHEELS: 19 AMG® MULTI-SPOKE, WHEEL LOCKING BOLTS, SOFT CLOSE DOORS, PANORAMA ROOF, ILLUMINATED DOOR SILLS, GRAPHITE GREY METALLIC, DRIVER ASSISTANCE PACKAGE -inc: Speed Limit Assist, PRESAFE Brake w/Collision Mitigation, Active Brake Assist w/Cross-Traffic Function, Active Distance Assist DISTRONIC, BAS® PLUS, PRESAFE PLUS, DISTRONIC PLUS® w/Steering Assist, PRESAFE PLUS, Active Lane Keeping Assist, Blind Spot Assist, DINAMICA HEADLINER BLACK, BLACK, EXCLUSIVE NAPPA LEATHER UPHOLSTERY, AMG® CARBON FIBER TRIM. This Mercedes-Benz SL has a powerful Twin Turbo Premium Unleaded V-8 4.7 L/285 engine powering this Automatic transmission. *These Packages Will Make Your Mercedes-Benz SL SL 550 The Envy of Your Friends *Wheels: 19 AMG® 5-Spoke, Wheels w/Silver Accents, Valet Function, Trunk/Hatch Auto-Latch, Trip Computer, Transmission: 9G-TRONIC Automatic, Tracker System, Tires: 255/35R19 Front & 285/30R19 Rear, Tire Specific Low Tire Pressure Warning, Tailgate/Rear Door Lock Included w/Power Door Locks, Systems Monitor, Streaming Audio, Sport Leather/Metal-Look Steering Wheel w/Auto Tilt-Away, Smartphone Integration, Siriusxm Traffic Real-Time Traffic Display, SIRIUS XM Satellite Radio, Side Impact Beams, Seats w/Leather Back Material, Run-Flat Tires, Remote Releases -Inc: Proximity Cargo Access. * Stop By Today *For a must-own Mercedes-Benz SL come see us at RBM of Atlanta, 7640 Roswell Road, Atlanta, GA 30350. Just minutes away! WHEELS: 19 FR/20 RR AMG® 5-SPOKE SILVER -inc: Tires: 265/35R19 Fr & 295/30R20 Rr, SELENITE GREY METALLIC, LANE TRACKING PACKAGE -inc: Blind Spot Assist, Lane Keeping Assist, KEYLESS GO® -inc: HANDS-FREE ACCESS, HEATED & VENTILATED FRONT SEATS W/MEMORY, FULL NAPPA LEATHER AMG® PERFORMANCE STEERING WHEEL -inc: silver-colored aluminum shift paddles and a 12-o'clock marking, BURMESTER SURROUND SOUND SYSTEM, BLACK, NAPPA LEATHER UPHOLSTERY, BLACK SOFT TOP, BLACK HEADLINER. This Mercedes-Benz AMG® GT has a strong Twin Turbo Premium Unleaded V-8 4.0 L/243 engine powering this Automatic transmission. *This Mercedes-Benz AMG® GT AMG® GT Has Everything You Want *AMG® PERFORMANCE EXHAUST SYSTEM, Wheels w/Silver Accents, Voice Activated Dual Zone Front Automatic Air Conditioning, Valet Function, Turn-By-Turn Navigation Directions, Trunk/Hatch Auto-Latch, Trip Computer, Transmission: 7-Speed Dual-Clutch Rear Transaxle -inc: mechanical limited slip differential, Transmission w/Driver Selectable Mode and AMG® SPEEDSHIFT® Sequential Shift Control w/Steering Wheel Controls, Tracker System, Tires: 255/35R19 Fr & 295/30R19 Rr, Tire Specific Low Tire Pressure Warning, Tailgate/Rear Door Lock Included w/Power Door Locks, Systems Monitor, Summer Performance Tires, Streaming Audio, Sport Tuned Suspension, Spare Tire Mobility Kit, Smart Device Integration, SIRIUS Satellite Radio. 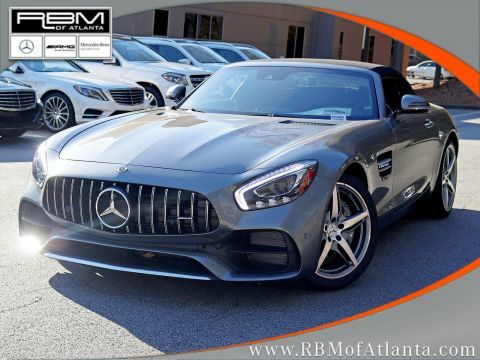 * Stop By Today *Test drive this must-see, must-drive, must-own beauty today at RBM of Atlanta, 7640 Roswell Road, Atlanta, GA 30350.WHEELS: 19 FR/20 RR AMG® 5-SPOKE SILVER -inc: Tires: 265/35R19 Fr & 295/30R20 Rr, SELENITE GREY METALLIC, LANE TRACKING PACKAGE -inc: Blind Spot Assist, Lane Keeping Assist, KEYLESS GO® -inc: HANDS-FREE ACCESS, HEATED & VENTILATED FRONT SEATS W/MEMORY, FULL NAPPA LEATHER AMG® PERFORMANCE STEERING WHEEL -inc: silver-colored aluminum shift paddles and a 12-o'clock marking, BURMESTER SURROUND SOUND SYSTEM, BLACK, NAPPA LEATHER UPHOLSTERY, BLACK SOFT TOP, BLACK HEADLINER. This Mercedes-Benz AMG® GT has a strong Twin Turbo Premium Unleaded V-8 4.0 L/243 engine powering this Automatic transmission. *This Mercedes-Benz AMG® GT AMG® GT Has Everything You Want *AMG® PERFORMANCE EXHAUST SYSTEM, Wheels w/Silver Accents, Voice Activated Dual Zone Front Automatic Air Conditioning, Valet Function, Turn-By-Turn Navigation Directions, Trunk/Hatch Auto-Latch, Trip Computer, Transmission: 7-Speed Dual-Clutch Rear Transaxle -inc: mechanical limited slip differential, Transmission w/Driver Selectable Mode and AMG® SPEEDSHIFT® Sequential Shift Control w/Steering Wheel Controls, Tracker System, Tires: 255/35R19 Fr & 295/30R19 Rr, Tire Specific Low Tire Pressure Warning, Tailgate/Rear Door Lock Included w/Power Door Locks, Systems Monitor, Summer Performance Tires, Streaming Audio, Sport Tuned Suspension, Spare Tire Mobility Kit, Smart Device Integration, SIRIUS Satellite Radio. * Stop By Today *Test drive this must-see, must-drive, must-own beauty today at RBM of Atlanta, 7640 Roswell Road, Atlanta, GA 30350. WHEELS: 20 AMG® TWIN 5-SPOKE W/GREY ACCENTS -inc: Tires: 265/40ZR20 Fr & 295/35ZR20 Rr, WARMTH & COMFORT PACKAGE -inc: Global Components Code, Heated Steering Wheel, Heated Front Door Panels & Armrests, Rapid Heating Front Seats, PARKING ASSISTANCE PACKAGE -inc: Surround View Camera, NATURAL GRAIN GREY ASH WOOD TRIM -inc: contrasting silver trim elements, HEATED REAR SEATS, GRAPHITE GREY METALLIC, DRIVER ASSISTANCE PACKAGE -inc: Traffic Sign Assist, Driver Assistance Package (23P), Evasive Steering Assist, Active Speed Limit Assist, Active Distance Assist DISTRONIC, Active Lane Change Assist, Active Brake Assist w/Cross-Traffic Function, pedestrian detection, PRESAFE® PLUS Rear-End Collision Protection, Active Steering Assist, Active Emergency Stop Assist, Route-Based Speed Adaptation, Active Lane Keeping Assist, Active Blind Spot Assist, DESIGNO BLACK DINAMICA HEADLINER, BLACK, NAPPA LEATHER UPHOLSTERY, AMG® PERFORMANCE NAPPA/DINAMICA STEERING WHEEL. This Mercedes-Benz AMG® GT has a powerful Twin Turbo Gas/Electric V-8 4.0 L/243 engine powering this Automatic transmission. *These Packages Will Make Your Mercedes-Benz AMG® GT AMG® GT 63 The Envy of Your Friends *AMG® NIGHT PACKAGE -inc: Local Component Code, AMG® Night Package (P60), Exhaust Tips, Side Sill Inserts, Window Trim, Mirror Covers, Black Front Splitter, Rear Diffuser Insert, AMG® DYNAMIC PLUS PACKAGE -inc: Drift Mode, Active Engine Mounts, AMG® Performance Full DINAMICA Steering Wheel, Yellow Brake Calipers w/Black AMG® Lettering, RACE Mode , Window Grid Diversity Antenna, Wheels: 19 AMG® 10-Spoke, Wheels w/Silver Accents, Ventilated Front Bucket Seats -inc: Fully electric, 12-way power front seats, 4-way power lumbar support and memory function, Valet Function, Turn-By-Turn Navigation Directions, Trunk/Hatch Auto-Latch, Trip Computer, Transmission: 9-Speed AMG® SPEEDSHIFT® MCT, Transmission w/Driver Selectable Mode, Tracker System, Tires: 255/45R19 Fr & 285/40R19 Rr, Tire Specific Low Tire Pressure Warning, Tailgate/Rear Door Lock Included w/Power Door Locks, Systems Monitor, Streaming Audio, Speed Sensitive Rain Detecting Variable Intermittent Wipers w/Heated Jets, Siriusxm Traffic Real-Time Traffic Display. 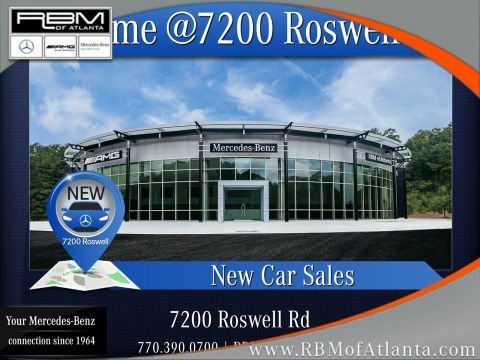 * Visit Us Today *Test drive this must-see, must-drive, must-own beauty today at RBM of Atlanta, 7640 Roswell Road, Atlanta, GA 30350.WHEELS: 20 AMG® TWIN 5-SPOKE W/GREY ACCENTS -inc: Tires: 265/40ZR20 Fr & 295/35ZR20 Rr, WARMTH & COMFORT PACKAGE -inc: Global Components Code, Heated Steering Wheel, Heated Front Door Panels & Armrests, Rapid Heating Front Seats, PARKING ASSISTANCE PACKAGE -inc: Surround View Camera, NATURAL GRAIN GREY ASH WOOD TRIM -inc: contrasting silver trim elements, HEATED REAR SEATS, GRAPHITE GREY METALLIC, DRIVER ASSISTANCE PACKAGE -inc: Traffic Sign Assist, Driver Assistance Package (23P), Evasive Steering Assist, Active Speed Limit Assist, Active Distance Assist DISTRONIC, Active Lane Change Assist, Active Brake Assist w/Cross-Traffic Function, pedestrian detection, PRESAFE® PLUS Rear-End Collision Protection, Active Steering Assist, Active Emergency Stop Assist, Route-Based Speed Adaptation, Active Lane Keeping Assist, Active Blind Spot Assist, DESIGNO BLACK DINAMICA HEADLINER, BLACK, NAPPA LEATHER UPHOLSTERY, AMG® PERFORMANCE NAPPA/DINAMICA STEERING WHEEL. This Mercedes-Benz AMG® GT has a powerful Twin Turbo Gas/Electric V-8 4.0 L/243 engine powering this Automatic transmission. *These Packages Will Make Your Mercedes-Benz AMG® GT AMG® GT 63 The Envy of Your Friends *AMG® NIGHT PACKAGE -inc: Local Component Code, AMG® Night Package (P60), Exhaust Tips, Side Sill Inserts, Window Trim, Mirror Covers, Black Front Splitter, Rear Diffuser Insert, AMG® DYNAMIC PLUS PACKAGE -inc: Drift Mode, Active Engine Mounts, AMG® Performance Full DINAMICA Steering Wheel, Yellow Brake Calipers w/Black AMG® Lettering, RACE Mode , Window Grid Diversity Antenna, Wheels: 19 AMG® 10-Spoke, Wheels w/Silver Accents, Ventilated Front Bucket Seats -inc: Fully electric, 12-way power front seats, 4-way power lumbar support and memory function, Valet Function, Turn-By-Turn Navigation Directions, Trunk/Hatch Auto-Latch, Trip Computer, Transmission: 9-Speed AMG® SPEEDSHIFT® MCT, Transmission w/Driver Selectable Mode, Tracker System, Tires: 255/45R19 Fr & 285/40R19 Rr, Tire Specific Low Tire Pressure Warning, Tailgate/Rear Door Lock Included w/Power Door Locks, Systems Monitor, Streaming Audio, Speed Sensitive Rain Detecting Variable Intermittent Wipers w/Heated Jets, Siriusxm Traffic Real-Time Traffic Display. * Visit Us Today *Test drive this must-see, must-drive, must-own beauty today at RBM of Atlanta, 7640 Roswell Road, Atlanta, GA 30350. WHEELS: 19 FR/20 RR AMG® TWIN-5-SPOKE BLACK, HEATED & VENTILATED FRONT SEATS, GLOSS CARBON FIBER CROSSBAR, FULL NAPPA AMG® PERFORMANCE STEERING WHEEL, DESIGNO DIAMOND WHITE, BURMESTER HIGH-END 3D SURROUND SOUND SYSTEM -inc: 11 high-performance loudspeakers including subwoofer, 11-channel amplifier w/active crossover and a system output of 1000 watts, BLACK, EXCLUSIVE NAPPA LEATHER UPHOLSTERY, BLACK DINAMICA HEADLINER, AMG® GLOSS CARBON FIBER TRIM, AMG® EXTERIOR NIGHT PACKAGE -inc: enhanced matte black finish for front splitter, air intake flics, front wheel arch flics, side sill extensions and high-gloss black fixed rear spoiler. This Mercedes-Benz AMG® GT has a strong Twin Turbo Premium Unleaded V-8 4.0 L/243 engine powering this Automatic transmission. *This Mercedes-Benz AMG® GT AMG® GT C Has Everything You Want *Voice Activated Dual Zone Front Automatic Air Conditioning, Valet Function, Turn-By-Turn Navigation Directions, Trunk/Hatch Auto-Latch, Trip Computer, Transmission: 7-Speed AMG® SPEEDSHIFT® DCT Automatic, Transmission w/Driver Selectable Mode, Tracker System, Tires: 265/35R19 Fr 305/30R20 Rr, Tire Specific Low Tire Pressure Warning, Tailgate/Rear Door Lock Included w/Power Door Locks, Systems Monitor, Streaming Audio, Spare Tire Mobility Kit, Smart Device Integration, SiriusXM Radio with Free Trial Period, Single DVD Drive, Side Impact Beams, Roll-Up Cargo Cover, Remote Releases -Inc: Proximity Cargo Access. 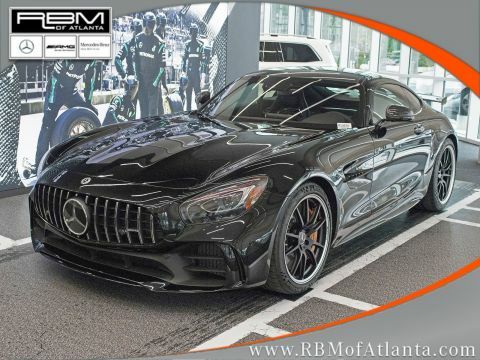 * Stop By Today *Test drive this must-see, must-drive, must-own beauty today at RBM of Atlanta, 7640 Roswell Road, Atlanta, GA 30350.WHEELS: 19 FR/20 RR AMG® TWIN-5-SPOKE BLACK, HEATED & VENTILATED FRONT SEATS, GLOSS CARBON FIBER CROSSBAR, FULL NAPPA AMG® PERFORMANCE STEERING WHEEL, DESIGNO DIAMOND WHITE, BURMESTER HIGH-END 3D SURROUND SOUND SYSTEM -inc: 11 high-performance loudspeakers including subwoofer, 11-channel amplifier w/active crossover and a system output of 1000 watts, BLACK, EXCLUSIVE NAPPA LEATHER UPHOLSTERY, BLACK DINAMICA HEADLINER, AMG® GLOSS CARBON FIBER TRIM, AMG® EXTERIOR NIGHT PACKAGE -inc: enhanced matte black finish for front splitter, air intake flics, front wheel arch flics, side sill extensions and high-gloss black fixed rear spoiler. This Mercedes-Benz AMG® GT has a strong Twin Turbo Premium Unleaded V-8 4.0 L/243 engine powering this Automatic transmission. *This Mercedes-Benz AMG® GT AMG® GT C Has Everything You Want *Voice Activated Dual Zone Front Automatic Air Conditioning, Valet Function, Turn-By-Turn Navigation Directions, Trunk/Hatch Auto-Latch, Trip Computer, Transmission: 7-Speed AMG® SPEEDSHIFT® DCT Automatic, Transmission w/Driver Selectable Mode, Tracker System, Tires: 265/35R19 Fr 305/30R20 Rr, Tire Specific Low Tire Pressure Warning, Tailgate/Rear Door Lock Included w/Power Door Locks, Systems Monitor, Streaming Audio, Spare Tire Mobility Kit, Smart Device Integration, SiriusXM Radio with Free Trial Period, Single DVD Drive, Side Impact Beams, Roll-Up Cargo Cover, Remote Releases -Inc: Proximity Cargo Access. * Stop By Today *Test drive this must-see, must-drive, must-own beauty today at RBM of Atlanta, 7640 Roswell Road, Atlanta, GA 30350. WHEELS: 19 FRONT/20 REAR AMG® CROSS-SPOKE, BLACK -inc: Forged, Tires: 255/35R19 Front & 285/30R20 Rear, WHEEL LOCKING BOLTS, SOFT CLOSE DOORS, POLAR WHITE, DRIVER ASSISTANCE PACKAGE -inc: Speed Limit Assist, Collision Mitigation (PRESAFE® Brake), Active Brake Assist w/Cross-Traffic Function, Active Distance Assist DISTRONIC, Active Steering Assist, BAS® PLUS, PRESAFE® PLUS, Cross-Traffic Assist, Active Lane Keeping Assist, Active Blind Spot Assist, DINAMICA HEADLINER BLACK, BLACK, NAPPA LEATHER UPHOLSTERY, AMG® PERFORMANCE SUSPENSION -inc: 2-stage adjustment, AMG® HIGH-PERFORMANCE COMPOSITE BRAKING SYSTEM, AMG® EXTERIOR NIGHT STYLING PACKAGE -inc: gloss black elements: lower front air splitter, lower rear apron, side view mirror covers and rocker panel insert. This Mercedes-Benz SL has a strong Twin Turbo Premium Unleaded V-8 5.5 L/333 engine powering this Automatic transmission. * Experience a Fully-Loaded Mercedes-Benz SL AMG® SL 63 *Wheels: 19 AMG® 10-Spoke Alloy (799), Wheels w/Machined w/Painted Accents Accents, Valet Function, Trunk/Hatch Auto-Latch, Trip Computer, Transmission: 7-Speed Sport w/AMG® SPEEDSHIFT® MCT, Tracker System, Tires: 255/35R19 Fr/285/30R19 Rr, Tire Specific Low Tire Pressure Warning, Systems Monitor, Streaming Audio, Spare Tire Mobility Kit, Smartphone Integration, Siriusxm Traffic Real-Time Traffic Display, SiriusXM satellite radio, Side Impact Beams, Remote Releases -Inc: Proximity Cargo Access, Remote Keyless Entry w/Integrated Key Transmitter, 2 Door Curb/Courtesy, Illuminated Entry and Panic Button, Refrigerated/Cooled Box Located In The Glovebox, Driver And Passenger Door Bins, Redundant Digital Speedometer. * Visit Us Today *For a must-own Mercedes-Benz SL come see us at RBM of Atlanta, 7640 Roswell Road, Atlanta, GA 30350. Just minutes away!WHEELS: 19 FRONT/20 REAR AMG® CROSS-SPOKE, BLACK -inc: Forged, Tires: 255/35R19 Front & 285/30R20 Rear, WHEEL LOCKING BOLTS, SOFT CLOSE DOORS, POLAR WHITE, DRIVER ASSISTANCE PACKAGE -inc: Speed Limit Assist, Collision Mitigation (PRESAFE® Brake), Active Brake Assist w/Cross-Traffic Function, Active Distance Assist DISTRONIC, Active Steering Assist, BAS® PLUS, PRESAFE® PLUS, Cross-Traffic Assist, Active Lane Keeping Assist, Active Blind Spot Assist, DINAMICA HEADLINER BLACK, BLACK, NAPPA LEATHER UPHOLSTERY, AMG® PERFORMANCE SUSPENSION -inc: 2-stage adjustment, AMG® HIGH-PERFORMANCE COMPOSITE BRAKING SYSTEM, AMG® EXTERIOR NIGHT STYLING PACKAGE -inc: gloss black elements: lower front air splitter, lower rear apron, side view mirror covers and rocker panel insert. This Mercedes-Benz SL has a strong Twin Turbo Premium Unleaded V-8 5.5 L/333 engine powering this Automatic transmission. * Experience a Fully-Loaded Mercedes-Benz SL AMG® SL 63 *Wheels: 19 AMG® 10-Spoke Alloy (799), Wheels w/Machined w/Painted Accents Accents, Valet Function, Trunk/Hatch Auto-Latch, Trip Computer, Transmission: 7-Speed Sport w/AMG® SPEEDSHIFT® MCT, Tracker System, Tires: 255/35R19 Fr/285/30R19 Rr, Tire Specific Low Tire Pressure Warning, Systems Monitor, Streaming Audio, Spare Tire Mobility Kit, Smartphone Integration, Siriusxm Traffic Real-Time Traffic Display, SiriusXM satellite radio, Side Impact Beams, Remote Releases -Inc: Proximity Cargo Access, Remote Keyless Entry w/Integrated Key Transmitter, 2 Door Curb/Courtesy, Illuminated Entry and Panic Button, Refrigerated/Cooled Box Located In The Glovebox, Driver And Passenger Door Bins, Redundant Digital Speedometer. * Visit Us Today *For a must-own Mercedes-Benz SL come see us at RBM of Atlanta, 7640 Roswell Road, Atlanta, GA 30350. Just minutes away! WHEELS: 19 FR/20 RR AMG® 5-TWIN SPOKE BLACK, HEATED & VENTILATED FRONT SEATS W/MEMORY (STD), FULL DINAMICA AMG® PERFORMANCE STEERING WHEEL -inc: silver-colored aluminum shift paddles and a 12-o'clock marking, EXCLUSIVE TRIM CONTROL CODE, BLACK, EXCLUSIVE NAPPA LEATHER UPHOLSTERY, BLACK SOFT TOP, BLACK DINAMICA HEADLINER, AMG® SOLARBEAM YELLOW METALLIC, AMG® MATTE CARBON FIBER TRIM, AMG® INTERIOR NIGHT PACKAGE -inc: black or high-gloss black door sill w/AMG® lettering illuminated in white, steering wheel spokes, steering wheel bezel, steering wheel gearshift paddles, seat insert beneath the head restsraints and luggage compartment strut. This Mercedes-Benz AMG® GT has a powerful Twin Turbo Premium Unleaded V-8 4.0 L/243 engine powering this Automatic transmission. *These Packages Will Make Your Mercedes-Benz AMG® GT AMG® GT C Roadster The Envy of Your Friends *AMG® EXTERIOR NIGHT PACKAGE -inc: high-glass black front splitter, air inlet grille in front apron, air outlet grille on engine bonnet, air outlet grilles behind the front wings, fins, exterior mirror housings, trim strip in the diffuser insert and 2 black tailpipe trim elements , Wheels w/Machined w/Painted Accents Accents, Voice Activated Dual Zone Front Automatic Air Conditioning, Valet Function, Turn-By-Turn Navigation Directions, Trunk/Hatch Auto-Latch, Trip Computer, Transmission: 7-Speed Dual-Clutch Rear Transaxle -inc: electronic limited slip differential, Transmission w/Driver Selectable Mode and AMG® SPEEDSHIFT® Sequential Shift Control w/Steering Wheel Controls, Tracker System, Tires: Summer Performance, Tires: 265/35R19 Fr & 305/30R20 Rr, Tire Specific Low Tire Pressure Warning, Tailgate/Rear Door Lock Included w/Power Door Locks, Systems Monitor, Streaming Audio, Sport Front Seats w/Power 4-Way Driver Lumbar, Spare Tire Mobility Kit, Smart Device Integration, SiriusXM AM/FM/Satellite w/Seek-Scan, In-Dash Mounted Single CD, MP3 Player, Clock, Speed Compensated Volume Control, Aux Audio Input Jack, Steering Wheel Controls, Voice Activation, Radio Data System, Weatherband, DVD-Audio, mbrace® External Memory Control and 6 Gb Internal Memory. 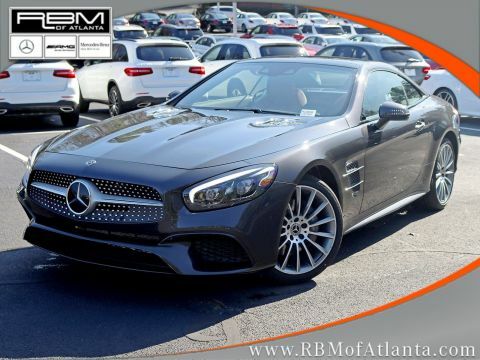 * Stop By Today *Treat yourself- stop by RBM of Atlanta located at 7640 Roswell Road, Atlanta, GA 30350 to make this car yours today!WHEELS: 19 FR/20 RR AMG® 5-TWIN SPOKE BLACK, HEATED & VENTILATED FRONT SEATS W/MEMORY (STD), FULL DINAMICA AMG® PERFORMANCE STEERING WHEEL -inc: silver-colored aluminum shift paddles and a 12-o'clock marking, EXCLUSIVE TRIM CONTROL CODE, BLACK, EXCLUSIVE NAPPA LEATHER UPHOLSTERY, BLACK SOFT TOP, BLACK DINAMICA HEADLINER, AMG® SOLARBEAM YELLOW METALLIC, AMG® MATTE CARBON FIBER TRIM, AMG® INTERIOR NIGHT PACKAGE -inc: black or high-gloss black door sill w/AMG® lettering illuminated in white, steering wheel spokes, steering wheel bezel, steering wheel gearshift paddles, seat insert beneath the head restsraints and luggage compartment strut. This Mercedes-Benz AMG® GT has a powerful Twin Turbo Premium Unleaded V-8 4.0 L/243 engine powering this Automatic transmission. *These Packages Will Make Your Mercedes-Benz AMG® GT AMG® GT C Roadster The Envy of Your Friends *AMG® EXTERIOR NIGHT PACKAGE -inc: high-glass black front splitter, air inlet grille in front apron, air outlet grille on engine bonnet, air outlet grilles behind the front wings, fins, exterior mirror housings, trim strip in the diffuser insert and 2 black tailpipe trim elements , Wheels w/Machined w/Painted Accents Accents, Voice Activated Dual Zone Front Automatic Air Conditioning, Valet Function, Turn-By-Turn Navigation Directions, Trunk/Hatch Auto-Latch, Trip Computer, Transmission: 7-Speed Dual-Clutch Rear Transaxle -inc: electronic limited slip differential, Transmission w/Driver Selectable Mode and AMG® SPEEDSHIFT® Sequential Shift Control w/Steering Wheel Controls, Tracker System, Tires: Summer Performance, Tires: 265/35R19 Fr & 305/30R20 Rr, Tire Specific Low Tire Pressure Warning, Tailgate/Rear Door Lock Included w/Power Door Locks, Systems Monitor, Streaming Audio, Sport Front Seats w/Power 4-Way Driver Lumbar, Spare Tire Mobility Kit, Smart Device Integration, SiriusXM AM/FM/Satellite w/Seek-Scan, In-Dash Mounted Single CD, MP3 Player, Clock, Speed Compensated Volume Control, Aux Audio Input Jack, Steering Wheel Controls, Voice Activation, Radio Data System, Weatherband, DVD-Audio, mbrace® External Memory Control and 6 Gb Internal Memory. * Stop By Today *Treat yourself- stop by RBM of Atlanta located at 7640 Roswell Road, Atlanta, GA 30350 to make this car yours today! WHEELS: 19 FR/20 RR AMG® PERF FORGED TWIN 5-SPOKE -inc: Black, LANE TRACKING PACKAGE -inc: Blind Spot Assist, Lane Keeping Assist, EXCLUSIVE INTERIOR PACKAGE -inc: Extended Interior Lighting, Black Dinamica Headliner, CONVENIENCE PACKAGE -inc: KEYLESS GO, Garage Door Opener, Autodimming Mirrors, Power Folding Mirrors, BURMESTER SURROUND SOUND SYSTEM -inc: 10 high-performance speakers including subwoofer in rear, 10-channel DSP amplifier w/a total system output of 640 watts, BLACK W/SILVER, NAPPA/DINAMICA EXCLUSIVE LEATHER UPHOLSTERY, BLACK, AMG® MATTE CARBON FIBER TRIM, AMG® HIGH-PERF CERAMIC COMPOSITE BRAKING SYSTEM, AMG® EXTERIOR CARBON FIBER PACKAGE II -inc: carbon fiber side view mirror housings, Carbon Fiber Rear Fixed Wing w/Lateral End Plates. This Mercedes-Benz AMG® GT has a strong Twin Turbo Premium Unleaded V-8 4.0 L/243 engine powering this Automatic transmission. *This Mercedes-Benz AMG® GT AMG® GT R Has Everything You Want *Valet Function, Turn-By-Turn Navigation Directions, Trunk/Hatch Auto-Latch, Trip Computer, Transmission: 7-Speed AMG® SPEEDSHIFT® DCT Automatic, Transmission w/Driver Selectable Mode and AMG® SPEEDSHIFT® Sequential Shift Control w/Steering Wheel Controls, Tracker System, Tires: 275/35ZR19 Fr 325/30ZR20 Rr, Tire Specific Low Tire Pressure Warning, Tailgate/Rear Door Lock Included w/Power Door Locks, Systems Monitor, Streaming Audio, Spare Tire Mobility Kit, Smart Device Integration, SiriusXM Radio with Free Trial Period, Single DVD Drive, Side Impact Beams, Roll-Up Cargo Cover, Remote Releases -Inc: Proximity Cargo Access, Remote Keyless Entry w/Integrated Key Transmitter, Illuminated Entry, Illuminated Ignition Switch and Panic Button. 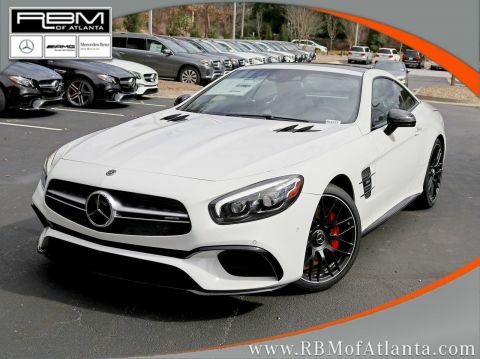 * Stop By Today *You've earned this- stop by RBM of Atlanta located at 7640 Roswell Road, Atlanta, GA 30350 to make this car yours today!WHEELS: 19 FR/20 RR AMG® PERF FORGED TWIN 5-SPOKE -inc: Black, LANE TRACKING PACKAGE -inc: Blind Spot Assist, Lane Keeping Assist, EXCLUSIVE INTERIOR PACKAGE -inc: Extended Interior Lighting, Black Dinamica Headliner, CONVENIENCE PACKAGE -inc: KEYLESS GO, Garage Door Opener, Autodimming Mirrors, Power Folding Mirrors, BURMESTER SURROUND SOUND SYSTEM -inc: 10 high-performance speakers including subwoofer in rear, 10-channel DSP amplifier w/a total system output of 640 watts, BLACK W/SILVER, NAPPA/DINAMICA EXCLUSIVE LEATHER UPHOLSTERY, BLACK, AMG® MATTE CARBON FIBER TRIM, AMG® HIGH-PERF CERAMIC COMPOSITE BRAKING SYSTEM, AMG® EXTERIOR CARBON FIBER PACKAGE II -inc: carbon fiber side view mirror housings, Carbon Fiber Rear Fixed Wing w/Lateral End Plates. This Mercedes-Benz AMG® GT has a strong Twin Turbo Premium Unleaded V-8 4.0 L/243 engine powering this Automatic transmission. *This Mercedes-Benz AMG® GT AMG® GT R Has Everything You Want *Valet Function, Turn-By-Turn Navigation Directions, Trunk/Hatch Auto-Latch, Trip Computer, Transmission: 7-Speed AMG® SPEEDSHIFT® DCT Automatic, Transmission w/Driver Selectable Mode and AMG® SPEEDSHIFT® Sequential Shift Control w/Steering Wheel Controls, Tracker System, Tires: 275/35ZR19 Fr 325/30ZR20 Rr, Tire Specific Low Tire Pressure Warning, Tailgate/Rear Door Lock Included w/Power Door Locks, Systems Monitor, Streaming Audio, Spare Tire Mobility Kit, Smart Device Integration, SiriusXM Radio with Free Trial Period, Single DVD Drive, Side Impact Beams, Roll-Up Cargo Cover, Remote Releases -Inc: Proximity Cargo Access, Remote Keyless Entry w/Integrated Key Transmitter, Illuminated Entry, Illuminated Ignition Switch and Panic Button. * Stop By Today *You've earned this- stop by RBM of Atlanta located at 7640 Roswell Road, Atlanta, GA 30350 to make this car yours today!